The Image Engagement App allows Admins to easily customize an image based app for deployment on Facebook or your website. Social sharing options integrated to encourage fans to share your app. Admins can set the sharing core information for the Share button, Pinterest Pin, +1 and Tweet to strengthen the message from your Page that goes out when fans share the information. The Like, Share, and +1 pull from the Title, Description, and Image fields, and the Tweet text has a counter to help you stay within a 140 character limit. Gold and Platinum levels offer a Like Gate image option that should be loaded at 810 x 810 pixels. Platinum Plans have the Promotional Tools area active enabling Admins to more easily drive traffic to their tabs from their website or blog by allowing you to upload an image and grab embed code to add to your blog or site. This image call-out will link to the app. Scroll down to the Photo and Video Apps area and click "Add" on the Image App. NOTE: Canva is now integrated in TabSite to allow you to custom template images in your app! Use Canva's or create your own by clicking the Canva button. Read more here. Once you have clicked the Add+ button, you will then be taken to the App Builder settings page. There are 2 options to upload your photo, the first one is by dragging/dropping the photo and the second option is by browsing it from your computer as shown here. To Drag (Firefox, Chrome, and Safari), simply drag a image onto the grey pad area. The third set of settings is the Promotion Tools, helping you to prepare social sharing for the app. 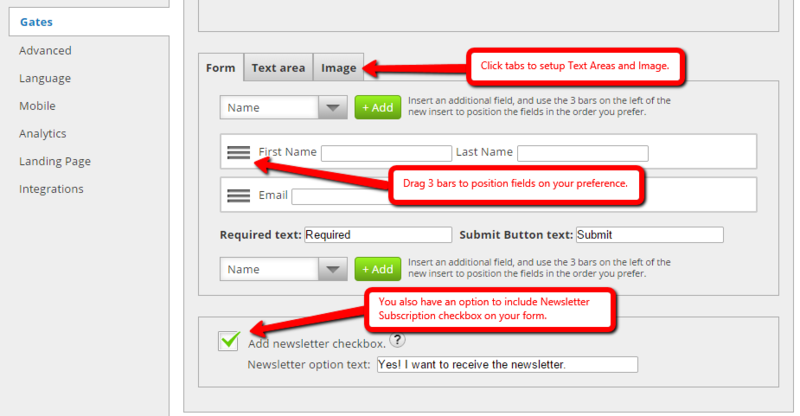 It has 4 sub-settings namely Social Sharing Options, Blog/Web Callout Tool, Post Planning and Comment System. of app, or both locations. As Admin, you can control the Facebook Share message and pre-populate the recommended Tweet and G+ share. Simply enter in your title and description as well as a custom image at size noted of 600 x 315. This will share the best size image in the social network selected. Form Gate is a simple form that users must complete and submit in order to access your app content. The fifth setting is called Advanced. In this setting, you are able to upload a header image, modify the link color, text color and background color. You can also customize your app's CSS by the provided default styles associated with it if you desire to. Another feature to help you with marketing is to implement remarketing pixels! We have a Pixel Tracking code area for Facebook and/ or Google Ads. By installing the pixel code from those services, you are then able to target visitors to your promotion back on that service with ads. Simply paste the pixel tracking code that they provide. The Language settings allows you to customize your app's language. It consist of 2 sub-settings namely General and Comment System and enables you to replace the default English with text/language of your choice. The General sub-settings has two drop-down menus namely Like button language and Tweet button language options and a Share button text box. This changes the buttons according to the language options that each social network offers. The seventh setting is the Mobile setting. It consists of Global Options which is answerable by either yes or no. These are "Render desktop version on mobile" and "Use like gate on mobile devices." This gives the option to display a mobile friendly alternative version of the app content to mobile users or display the same information. Note: Not all apps have a mobile difference. The Analytics section is composed of multiple graphs of the Image App. It consists of Overview, Facebook Views, Web Views, Mobile Views, Microsite Views, Shares and Likes, giving you information on what the impact of the app traffic has been and from where. Landing Pages are a powerful feature allowing you to create lead capture pages using any app. Landing pages are the perfect area to drive traffic to in order to create more leads. Any app can have a Landing Page. You may also change the title and header font color. 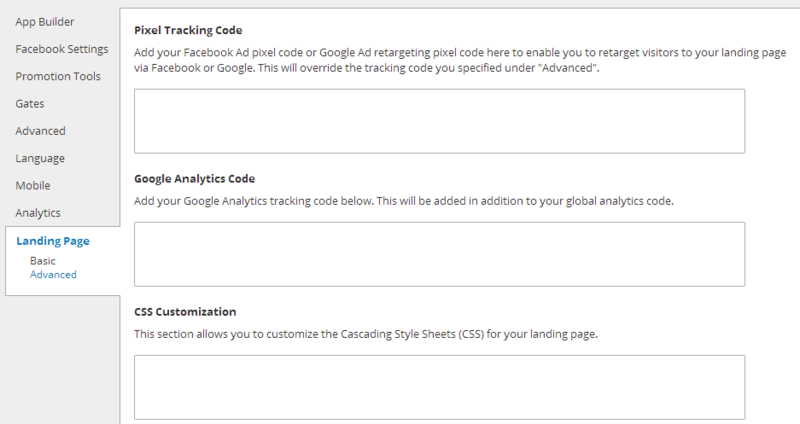 We give you the option to place the Pixel Tracking code for Facebook Ad's and/or Google Ad's on your landing page. This allows you to retarget/remarket to visitors via ads on those services. In addition, we also offer CSS control for advanced styling of your Landing page as well to use if desired. The "Integrations" area offers options for connecting forms to other services like Mailchimp, Infusionsoft, AWeber and Sendy. See full details on the Mailchimp integrations here with steps for setup so that your form data is automatically added to your service provider. This takes you back to the "My App" area where your app is highlighted. This is the location of all apps you have created for that TabSite Plan. You can create and test any app, you can simply publish apps according to your Plan features. To Publish your App, click "Publish" to go through the details of publishing your app to Facebook or a website.